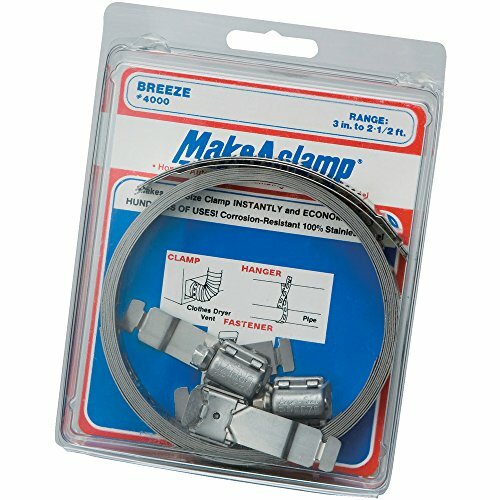 Breeze Make-A-Clamp Stainless Steel Hose Clamp System, 1 Kit contains: 8-1/2 ft band, 3 adjustable fasteners, 1 band splice (Pack of 1) by Breeze at In The National Interest. MPN: 4000. Hurry! Limited time offer. Offer valid only while supplies last. The Breeze 4000 Make-a-Clamp kit creates clamps that meet the needs of applications such as securing, mounting, strapping, clamping, and positioning. The Breeze 4000 Make-a-Clamp kit creates clamps that meet the needs of applications such as securing, mounting, strapping, clamping, and positioning. This kit creates clamps of 2" diameter and greater. A worm gear mechanism adjusts the clamp's diameter to apply uniform sealing pressure and provide strong clamping. The 9/16" wide screw saddle locks into the band to form a concentric circle and maintain a uniform seal. The banding, fasteners, and splice are made of stainless steel for resistance to corrosion. The slotted, 5/16" (8 mm) hex-head screw allows installation using a blade screwdriver, nut driver, or socket wrench, and is made of stainless steel that conforms to the Society of Automotive Engineers (SAE) 305 standard and provides resistance to corrosion. This Breeze 4000 hose clamp kit is suitable for creating a non-standard size hose clamp, such as for manufacturing plant maintenance.